Undertake an experience of river rafting in Kolad and explore the enchanting beauties while you go rafting on Kundalika River. Kolad is just 130 Kms from Mumbai, and availability of year round water sports makes it a great weekend getaway for an adventurous trip. With all protective gear and rafting equipment included and guidance by expert guides, you can rest assured about safety. Convenient add-on option available to include transport from Mumbai or Pune. Looking for a surge of adrenaline gushing through the veins, then Kolad is the place to be. Kolad is a small hamlet located in the Mahad region of Maharashtra, amidst the Sahyadri ranges. It is famous for the adventure activity of river rafting on the Kundalika River. This is the perfect river rafting experience for first timers. The rapids range from grade one to three and go in that ascending order. The thrill of adventure and respite of nature go hand in hand to give one a memorable experience. The river is dam controlled by two dams upstream and the water is slowly released into the river making it a perfect sport for white water rafting and other adventure activities. The Kolad River rafting on Kundalika River goes on for a 12-13 Km stretch and takes place under the supervision of trained guides and experts only. The surrounding valleys and wildlife are a path to paradise and are a must experience destination. One can easily leave their worries in the rapid flow of the Kundalika River and enjoy a wholesome thrilling experience. 5:00-5:30 am - Pickup from Mumbai or Pune residence/hotel (if transport add-on chosen). Otherwise you can report directly at reporting location in Kolad. Roundtrip travel from Mumbai (including Thane city and Navi Mumbai) OR Pune (Residence/Hotel) to Kolad and back. Pickup & drop facility to rafting start / end-point is not included in the rafting only package. In case you book transport through us, the driver will drop you at the start point and pick you up from the endpoint. 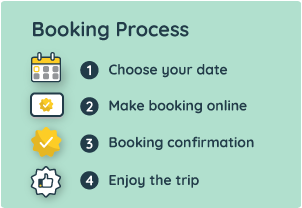 If you have booked only rafting (without transport), the meeting point will be communicated by the rafting coordinator after booking.